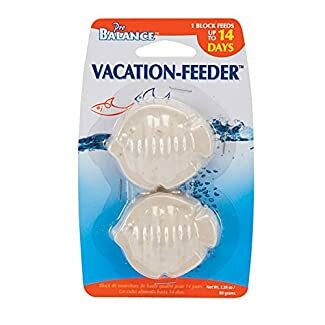 Pro Balance® Vacation Feeding Blocks help you enjoy your vacation while ensuring your precious fish are well fed. This package includes 2 fish-shaped feeders that can each feed 1-3 fish for up to 14 days. Each 14-Day Block releases a nutritious blend of freeze-dried foods and essential vitamins & minerals while also helping to neutralize your aquarium water pH levels. Simply place one block in your aquarium and the block will slowly dissolve releasing the nutritious freeze-dried foods. To get the best results and most efficient release of particles from feeding blocks, keep a minimum temperature of 72° F and a starting pH level of 6.6 to 7.0. Each feeder uses a time release formula to feed your 10-15 gallon tank for up to 14 days. Blocks are loaded with fish favorites like tubifex & bloodworm along with added essential vitamins, minerals & more. Each block can last up to 14 days depending on the pH level & temperature in your aquarium. Pro Balance® 14-Day Vacation Blocks are the perfect food for your fish while you are away. Each time-release block can feed your 10-15 gallon aquarium for up to 14 days. Made with Pro Balance® high-quality fish food. Contains fish favorites like tubifex & bloodworm along with essential vitamins, minerals & more! Vitamin fortified formula releases a nutritious freeze-dried food while also neutralizing aquarium water.